New year, new things: With the beginning of 2014, we have decided to add a new feature to the blog called "Friday Flashback". From now on, we will post an old picture of either the Grand Ducal Family of Luxembourg or the Princely Family of Liechtenstein on every Friday to ease you into the weekend. These pictures will range from historical pictures of the year dot to things that happened just a few years ago but are still nice to look at such as the double royal christening of Archduke Alexander, fourth child of Princess Marie-Astrid of Luxembourg and Archduke Carl-Christian of Austria, and his paternal cousin Archduke Michael, seventh child of Archduke Rudolf and Archduchess Hélène. 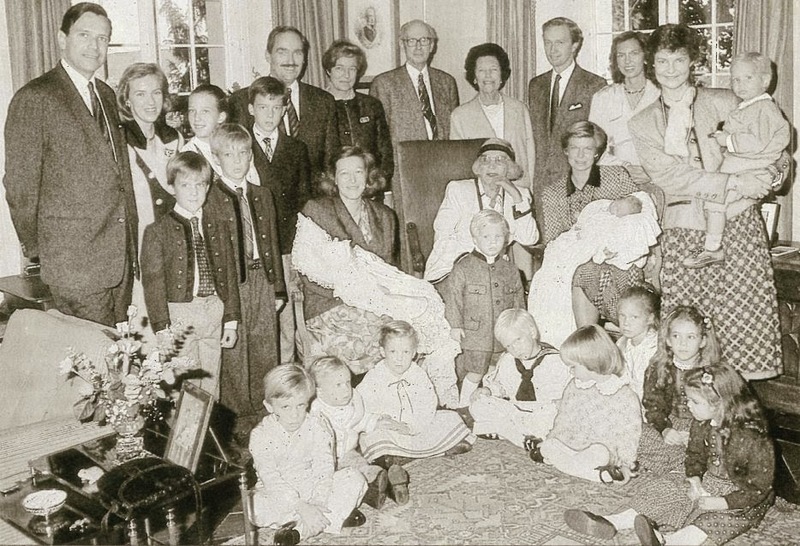 In the above pictures, you can see (standing, from left to right) Héctor Riesle, Archduchess Alexandra, Archduke Thomas, Archduchess Priscilla, Archduke Johannes, Archduke Carl-Christian, Archduke Rudolf, Baroness Marina de Villenfagne de Vogelsanck, Archduke Carl-Ludwig, Archduchess Yolande, Archduke Carl-Christian, Archduchess Constanza and Princess Margaretha with her youngest child, Prince Josef. Seated are (from left to right) Felipe Riesle de Habsbourg-Lorraine, Archduke Franz-Ludwig, Archduchess Hélène with Archduke Michael, Archduchess Marie-des-Neiges, Archduke Christoph (actually standing), Queen Marie-José of Italy, Archduke Imre, Archduchess Marie-Astrid with Archduke Alexander, Sofia Riesle de Habsbourg-Lorraine, Archduchess Marie-Christine, Princess Maria-Anunciata and Princess Marie-Astrid. Stay tuned for later today as there will be another edition of Friday Flashback to mark the beginning of this new series!